Want iPhone to wake you? Tap Alarm, then tap . 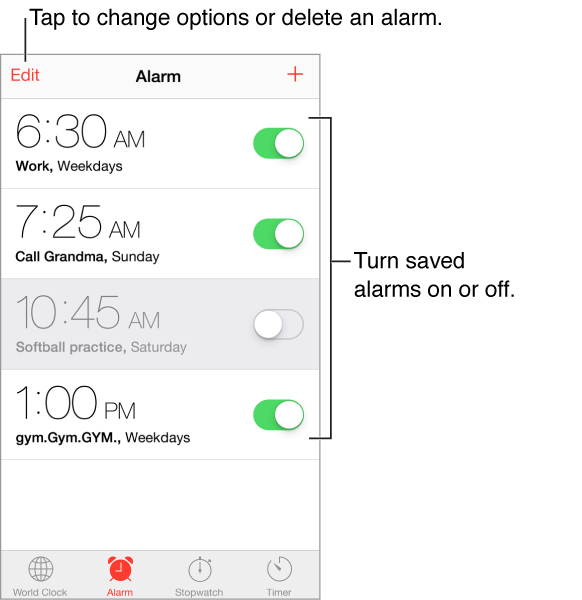 Set your wake-up time and other options, then give the alarm a name (like “Soccer practice”). Want to fall asleep to music or a podcast? Tap Timer, then tap When Timer Ends and choose Stop Playing at the bottom. Get quick access to clock features. Swipe up from the bottom edge of the screen to open Control Center, then tap . You can access alarms in Control Center even when iPhone is locked.